1 Season the chicken breast with salt and pepper. Cook for 10 minutes in the oven, let cool, and thinly slice. Halve the avocado, remove the seed, and remove the flesh of the avocado. Dice small and mix with the lemon juice, some salt, and tabasco sauce. Peel and finely grate the carrot. Rinse, trim, and thinly slice the scallions. Mix the carrots with the scallions and avocado, then gently mix in the mayonnaise. 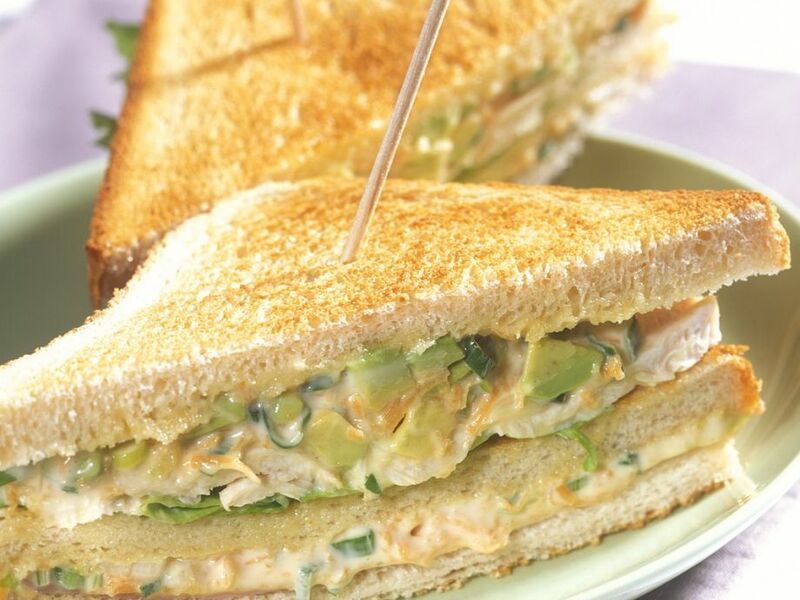 3 Top 4 slices of the bread with the ham, and then spread half of the avocado mayonnaise mixture. Top with a slice of toast, and then place 1 piece of lettuce and the slices of chicken. Top with the remaining avocado mixture, and finish with the the rest of the bread. To serve, cut diagonnaly and pierce each piece with a wooden skewer.